Back in the 1930s, the story goes, a city fellow drove off the Oregon Inlet ferry and approached one of the Works Project Administration workers who were erecting sand fences for the dune construction program on Hatteras Island. "How do I get to Hatteras?" he asked the young man. The WPA worker motioned south with his hand. "Take road 108," he said. The city fellow nodded and drove off, only to return a half-hour later. "Which road did you tell me to take to Hatteras ?" he asked the worker. "Mister," he said, "there are 108 roads to Hatteras." Pointing to the most recent tracks in the maze of ruts that disappeared into the distance, he said, "Take road 108." Sixty years ago, Hatteras Island had 108 roads. Today, it has one. Sometimes during bad weather, none. Highway 12 runs the length of the Outer Banks. From Ocracoke to Corolla, it skirts the dunes and marshes, towns and villages, offering travelers some of the prettiest views on the East Coast. The old road is nearly 50 years old along some sections. It's an often-thread-bare ribbon of asphalt that is the backbone of the Outer Banks. 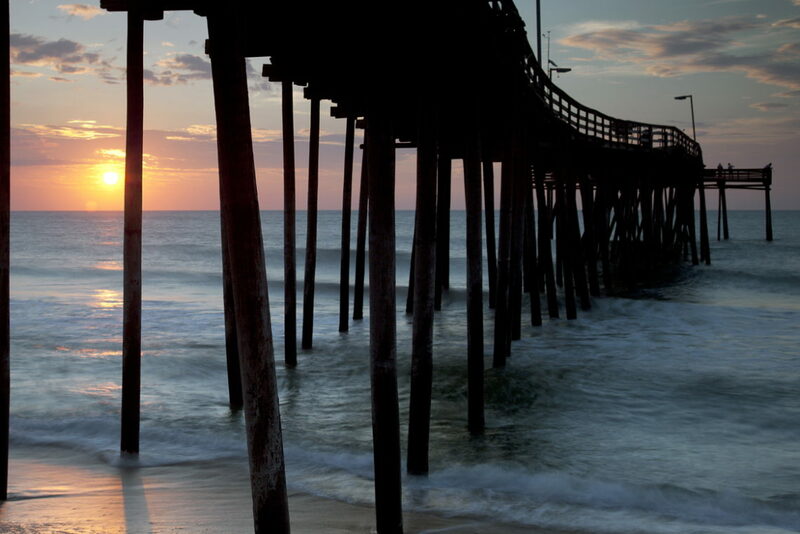 It's known as the "Beach Road" in the northern towns of Nags Head, Kill Devil Hills and Kitty Hawk. It's the only highway on the islands of Hatteras and Ocracoke. Old cottages and tumble-down gas stations still stand as testimony to times past. Hidden in bushes and behind new developments, they trace the routes the highway has taken over the years. Abrupt curves in the otherwise straight road tell the tale of the constant fight to keep the highway one step ahead of the hungry ocean. The bends are the result of rerouting the road after erosion and storms gobbled up dunes and pavement. As the Outer Banks moves, it is said, so moves its highway. With World War II drawing to a close and the downsizing of the coastal defense network, many believed that Hatteras Island would disappear back into the shadows of seclusion. There was no highway along its 60-mile length, only sand tracks disappearing into the distance. A ferry transported passengers and vehicles across Oregon Inlet, and another crossed Pamlico Sound from Hatteras village to the mainland. Promises of an all-weather road from Hatteras village to Oregon Inlet were made, and yet the first strip of asphalt was still to be laid. For those on the island, the situation was frustrating. As the rest of the country picked up pace and the age of the automobile accelerated, plans for a highway on the island remained stalled. Without a road, islanders were left to fend for themselves. A trip up the beach left the driver with two choices: the unpredictable beach side ("riding the wash") or the even more unpredictable "inside route." Neither was encouraging. Taking the beach route was the choice of many. Long, pristine sections of the beach bore no mark of civilization, except for the many shipwrecks littering the sands. "For every mile there was a wreck, for every wreck there was a deed of heroism and for every deed a dozen enchanting stories," former State publisher Bill Sharpe wrote in this magazine after a visit to the Outer Banks in 1952. Travel along the oceanside was dependable enough, as long as the tide wasn't too high or the wind hadn't driven the sand into "camelbacks." At low tide, with broad flat sections and plenty of space, it could even be a relatively quick and reliable route. Along the first 20 miles below Oregon Inlet there were no villages. Only the Pea Island Lifesaving Station, abandoned after the war, gave any hint of human activity. On the other side of the dunes, the "inside," travel could be nerve-wracking. The rule of the day was to follow the most auto tracks, regardless of where they meandered. The road traces were there by custom only, as there were no right-of-ways or maintenance operations, just sand and scrub vegetation. "The first 20 miles driving down from the Oregon Inlet ferry had a lot to do with determining whether you were suited for the Outer Banks or not," wrote Sharpe. Sharpe visited Hatteras Island as the road was nearing completion. Only the final section between Rodanthe and the inlet remained incomplete, and the outside world was beginning to take notice. For the casual observer, the problem might seem easy enough. Start paving at one end of the island and stop at the other. But there was more to the story than just paving a ribbon of asphalt along the moody and changing barrier islands of the Tar Heel coast. By building the highway, man drew a line in the sand and dared the ocean to cross it. The ocean has obliged many times over the past half-century. Without a paved road, the seven villages of Hatteras Island were secluded and insular. Travel was at the mercy of the weather. Rumor and gossip moved faster than traffic. The isolation fostered natural divisions among the residents of the different villages. People tended to stay in the villages, and many liked it that way. Since the 1920s, when Hatteras islanders first began paying taxes for road construction, they had waited for their turn. The situation persisted for more than 20 years, and the people grew tired. They banded together and worked for their cause. During World War II, a group traveled to Raleigh to meet with Governor J. Melville Broughton and to lobby for the construction of a road. They brought a special calling card from the Outer Banks: fresh shad. "These are the first shad eaten in Raleigh the day after they were caught and if we can get a highway, we will have a better market for our products and the consumer will get a better product," said Maurice Burrus, a former Major League Baseball player, Hatteras native and spokesman for the group. The governor pledged to travel to Hatteras, "the only place in North Carolina where I have not been." But he was careful not to pledge the road. He might have been questioning his decision the following year when he made the trip. After crossing Oregon Inlet, Broughton began the trip down the sand tracks in the company of island dignitaries. The Hatteras delegation was led by Burrus and a company of familiar local names. The motorcade became so stuck in the sand that even the governor himself was enlisted to push the vehicles out of trouble. He left with sand in his shoes and promises of action, but without delivering the "meat and bread road" to the islanders. The islanders still had no road. Governor R. Gregg Cherry, Broughton's successor, had made the Hatteras Island road project one of his campaign promises. In a stump speech in Manteo, Cherry promised an all-weather road during his administration. But not everyone on the Outer Banks seemed to think that a road along the southern reaches of Dare County was such a good idea. Rumors of perfidy and intrigue buzzed along the Outer Banks. "Consideration, dissatisfaction and even anger is expressed at the attitude of one or two people further north who are believed to have consistently blocked road improvements to Hatteras Island, in hope of getting all the available money spent in more distant areas," reported the Dare County Times in an April 1946 editorial. "It is well-known that one or two hotel people at Nags Head do not want any road-building south of Oregon Inlet," the newspaper reported. Despite the problems and pressures, Governor Cherry moved ahead to fulfill his promise. It soon became clear that construction of the road would be more complex than many had imagined. Cherry tried to link road construction with school consolidation. "If Dare County will provide these communities with a modern high school, I will guarantee that there will be a road for the school buses to operate over," Cherry said. Locals cried foul. Consolidation had never been a part of the bargain before, they countered, and there was little chance of getting those in Avon and Hatteras to agree to anything, much less sending their children to be schooled under the same roof. The islanders said that those who had Cherry's ear should have known better, and that perhaps they did. They kept up the pressure for a no-strings project. Cherry finally acquiesced, and plans for the project moved forward. Construction costs were going to be significant. No one felt that the entire project could be completed in one phase. But where to begin was a prickly subject. A road to a section of the island would give the villages served an advantage. While the islanders might not have been counted on to agree to school consolidation, they at least needed to agree on where the construction should begin. The new road was to proceed in sections. Planners let the islanders decide where the first sections of road would be placed. The villagers of Hatteras, Frisco, Buxton and Avon - 2,200 strong - opted for work to connect Hatteras and Avon. Then two other segments, from Avon to Rodanthe, and then Rodanthe to the inlet, would be completed. Work began in Hatteras and headed north. The harbor at Hatteras was the best place to unload heavy equipment and supplies. More than 17 miles linking Hatteras and Avon were completed in 1948. Another 18-mile section joining Avon and Rodanthe was finished in l952. The final leg was completed in 1953. "Naturally, a highway to such a special place would be kind of special," Sharpe wrote. "And the highway being built from Oregon Inlet to the village of Hatteras is one of the most unique ever attempted. This one is being constructed according to specifications laid down by the wind and the sea. Contractors who have punctured mountains and spanned gorges soon learned that damp sand in a northeaster is more formidable than granite and space." The company selected for the project, Ballenger and Associates of Greenville, was ready to try. It was a formidable task. One of the principal problems was the elevation of the roadway. If the road was built too high, roadbed would be undercut by the frequent overwash. If it was built too low, it would be covered by sand dunes. As a result, the road was built as close to the natural contours of the land as possible. This allowed both sand and water to move easily across the road surface without damaging the highway. Ballenger had a plan. The firm equipped the road with concrete shelves extending 12 feet past the road's edge. The shelves prevented the tide that flowed across the road during storms from undercutting important sections of the roadbed. Damage to the margins was incidental and could be repaired. Ballenger used the endless supply of sand in the project. The sand was mixed with asphalt and naphtha and applied. When the naphtha evaporated, only the sand-rich asphalt remained. Sharpe said that the project would go down in history as the only one in which a barge sank where a curb would be on a normal highway. The barge, loaded with trucks and equipment, sank in a December 1947 storm. Using a diver and huge cranes, Ballenger recovered equipment, marking it down to yet another hazard of the contract. With the opening of the highway came something else: rules. In 1950, virtually no one on Hatteras Island had a driver's license or vehicle registration. The initial sections of the highway, along the remote southern portion of the island, lacked road signs, and the people took care of themselves along the dead-end highway. With the opening of the road to Oregon Inlet, however, things had to change. State officials traveled to Hatteras to administer a mass examination to the 500 or so residents interested in obtaining a driver's license. Unfortunately, with no road signs or experience in "mainland" driving, many failed the first test. Undaunted, the majority passed the exam by the time the road opened. Coupled with the completion of the Herbert C. Bonner Bridge across Oregon Inlet in 1964, Highway 12 has played a key role in the development of the Outer Banks. Virtually every part for every house, business and boat has moved along the road as the islands have swelled with development. But the transient nature of North Carolina's barrier islands has made life miserable for the highway. As the islands continue their inevitable march to the southwest, the road is under relentless assault from the drifting dunes and frequent ocean overwash. Emergency maintenance to portions of the highway through the problem portions of the Pea Island Wildlife Refuge has become routine. Officials tip their hats to the ocean. They don't really expect to prevail. "Hatteras Island is the hardest road in the state of North Carolina, bar none," says R.V Owens III, Dare County's representative on the North Carolina Board of Transportation. "In the western part of the state they have rock slides. It's bad, with lots of earth and big boulders across the road. But let's face it, we're talking about the Atlantic Ocean here." Highway 12, the vital lifeline of the Outer Banks that has served islanders so well for the last half-century, is approaching a critical point in its life span. While life on Hatteras Island without the highway might seem inconceivable, officials acknowledge that a critical break could come with any storm. If that occurs, islanders and visitors might once again struggle with the 108 roads to Hatteras.